The launch of Amazon’s social channels for the upcoming series last month gave us a map—because all good Middle-earth stories start with a nice map, honestly. It was pretty undetailed, but that didn’t stop it from giving us some vague hints of speculation as to just when the show could be set. 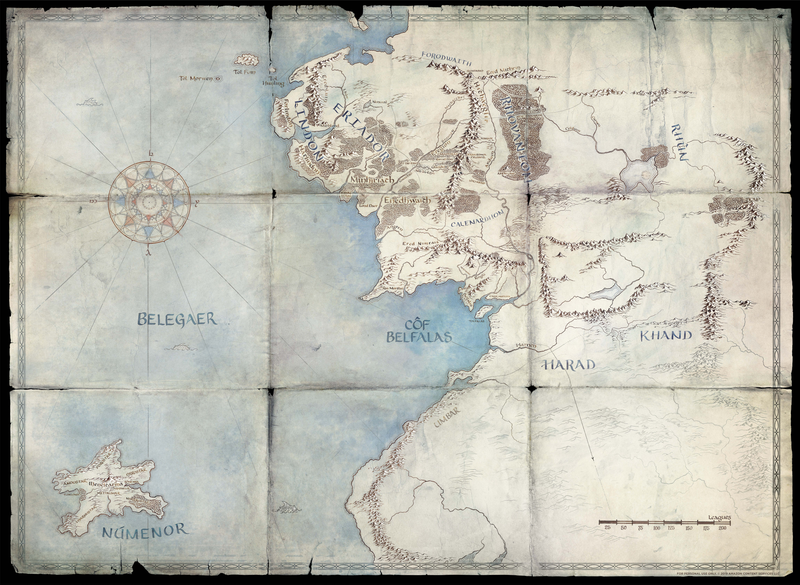 But today, the company launched a new version of the interactive map that added a pretty significant landmass, before indeed confirming what many LotR fans had theorised: The show will be set in the Second Age, and the isle of Númenor will play an important role. For those fans unfamiliar with the vast complexities of Middle-earth history, there are basically four main “Ages” in the timeline: The Lord of the Rings and The Hobbit are set in the Third Age (with the former heralding the Fourth Age with the defeat of Sauron), for example, after the battle of the Last Alliance in Mordor and Sauron’s momentary defeat marked the conclusion of the Second Age. So we’re essentially seeing a build-up to that process from the Lord of the Rings movie saga’s opening—which gave us the Last Alliance’s climactic assault and the death of Elendil, the King of Gondor, with the One Ring passing to his son, Isildur—in this new show. Or at least, we might. The Second Age lasted a very long time (nearly 3,500 years), so while the formation of the Last Alliance of Elves and Men and Sauron’s rise occurs at the tail end of the Age, the addition of Númenor to Amazon’s map at least suggests the show could potentially not follow that—which would’ve been a way to tie the series more directly into the lineage and iconography of the Peter Jackson saga—but instead chronicle the downfall of the fabled civilisation of Man that Aragorn’s bloodline was descended from. He likely won’t be featured if this is the Second Age however, as he was born in the Third, by the way. But the more important thing here is that Númenor was sunk below the sea roughly a hundred years before the formation of the Last Alliance. That happened when the Valar—who are basically the gods of Middle-earth—destroyed the island after its then-current king, Ar-Pharazôn, was corrupted by Sauron and deceived into assaulting the Undying Lands in the West, breaking the pact between Númenor and the Valar that had been made at the beginning of the Second Age. So if it’s still on the map, the show is likely set well before the War of the Last Alliance against Sauron. All this from just a map? It’s...a lot, like all Middle-earth lore is. But it means there is plenty of ground for Amazon’s series to cover, including fundamental events that have far-flung connections to The Lord of the Rings stories we’re familiar with in both the original books and the films. Who knows, maybe it could have it both ways—the series could start with Númenor’s fall and show us Sauron’s rise and the formation of the Last Alliance. Or it could be more focused on Númenor’s decline and highlight characters like Elendil and Isildur, before we knew them as the founders of Arnor and Gondor. It could go back even further into the Second Age, and show us the Rings of Power being forged by Sauron and Celebrimbor. Those are things that are not quite as movie-era-prequel-y as the Last Alliance, but still, events that have important ties to the stories most fans are familiar with. But for now, the Second Age setting is all we really know about the show—and we’ve got quite a while to keep speculating about it, given that the series is projected to hit Amazon Prime by the end of 2021.